Here's your chance to own one of the most collectible tube pre-amplifiers in the world. 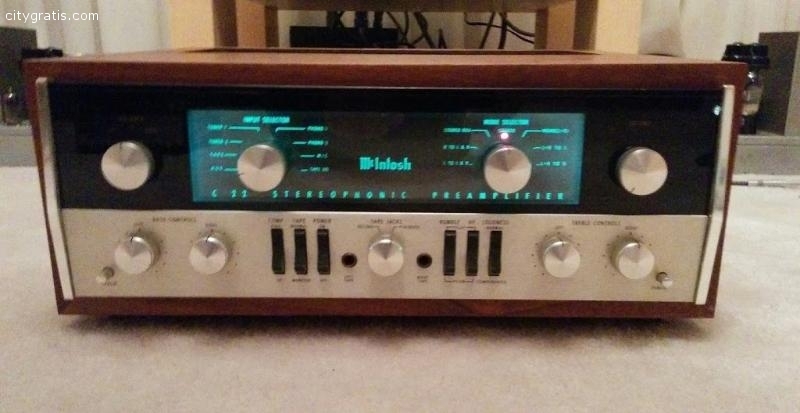 An extremely rare vintage McIntosh C22. In good cosmetic condition and from smoke-free environment. All original factory parts (capacitors and resistors) except the volume switch (replaced by step up potentiometer made with 0.1 percent metal film resistors costing $400) and the rear RCA sockets (replaced by heavy gold plated RCA sockets). Also comes with matching wooden cabinet and six 12AX7 tubes(2 Tungsram, 1 EI and 3 other unbranded). 117 Volt. What you see is what you get!